Embark on a mysterious quest in search of the missing groom, Charles Gilbertworth. Solve riddles, encounter supernatural creatures and ghosts, all while solving relaxing and fun Mahjong puzzles with innovative gameplay mechanics in The Mahjong Huntress! 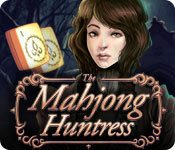 The Mahjong Huntress is rated 3.0 out of 5 by 27. Rated 5 out of 5 by flyawayfaye22 from For the Mahjong Completionist I'm honestly shocked this game has such a mediocre rating - I loved it and have played my fair share of Mahjong games! There's a fun tale with our huntress, Mary Riley, and I hope a mahjong sequel comes out continuing her story...... And if the developer wants to turn her story into an HOA that would be super too (HINT HINT). The graphics are lovely, the music is eerie enough to reflect the tone, and there are periodic journal entries from Mary's kidnapped suitor to offer insight into their relationship. As far as the mahjong puzzles: there are 6 chapters within the story containing several levels each of mahjong puzzles. 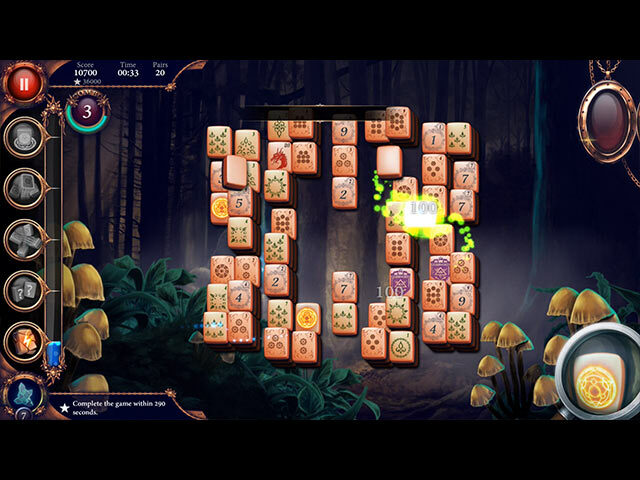 Each level has a 3-star rating: 1 for completion, 1 for high score, and 1 for the bonus goal. There are also Achievements; once you "CLAIM" a completed achievement, it earns you energy crystals for power-ups that are helpful when completing hard bonus objectives for more difficult levels. Each chapter also has a 3-star Match-3 boss battle. There are another 232 mahjong puzzle "Mystery Challenges" with high scores & bonus objectives to play in addition to the story. The one thing I could see as a criticism is the lack of variety. Other than the boss battles, this game is straight mahjong and for gamers used to mini-games breaking up the main play style, this will be a disappointment. Overall, as a gaming "completionist" and lover of mahjong, this game has provided hours of entertainment and relaxation I'm STILL enjoying on the daily and is a MUST OWN. I usually take advantage of sales to make game purchases so getting this game on the cheap has made it even sweeter, but Mahjong Huntress is well worth the full price considering the amount of puzzles and time you will put into it! Rated 5 out of 5 by vanenkrieg from Astonishing, yes. Although you don't exactly "hunt" for the tiles, this game is interesting enough to leave my review. While I don't usually waste my time to decomplete the Mahjong stacks, I gave this one a try, once I read it is story driven. After first three minutes of playing, I was absolutely crestfallen by the quality and the atmosphere of this unusual combination. The graphics is great, the polishing is perfect and the idea you unroll the story by uncovering the puzzles (yes, behind Mahjong stacks) is remarkable after a while. Mastering the levels for 2 or 3 stars makes no difference for me, but as long as the story keeps me engaged till the end of trial, I'll buy this one. Rated 5 out of 5 by blitz7 from Fascinating! The beautiful art and music combined with mysterious storyline all in old English style makes this game really unique and for me even some thrilling during evenings play-sessions with the lights off. The game is a whole story with mahjong and match three immersed into as elements of storyline but fortunately if the story is already finished and there are no need to read it again there is possibility to skip it. The mahjong game is classic but extended by magic powers which make the game a little bit easier and the same goes to match three. If I play to relax myself I don't use them but if I master the stack to three stars the magic powers are very useful. Rated 5 out of 5 by battleboar from Mirror, mirror on the wall, the best Mahjong of them all? 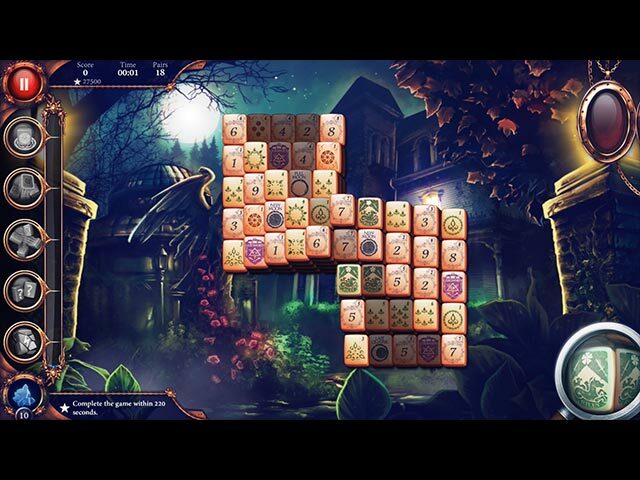 Woow, this game simply adds a magic factor to the basic Mahjong game we love! 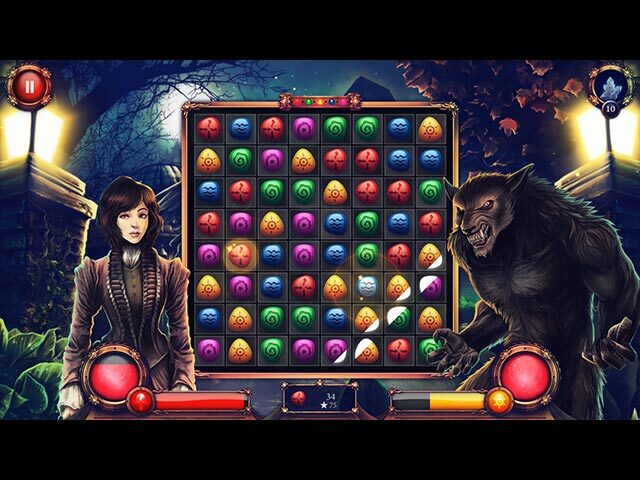 It's gothic, mysterious, romantic and full of surprises (could you expect Match 3 levels woven into the story??). My only concern: the Mahjong tile emblems look tiny at the first glance, but since I was able to adjust the scale with a mouse wheel, this is no longer an issue. Long story short, this is the one of the most refreshing titles I've been playing recently (not very soon though, as my wife just nailed it down...). Rated 5 out of 5 by cleggum from Enjoyable Game I first thought this would be a rather simple game, I was wrong. I love playing Mahjong and I'm always looking for new games to play. The first part was rather simple and I didn't think I would buy it - then I hit a couple chapters in and it became more difficult to complete each game in one try or several tries. It can be a bit challenging and I think most mahjong players would enjoy it. I just wish the text from the huntress would appear all in one talk box instead of one sentence in several boxes. That's annoying. But overall a good game. Rated 5 out of 5 by evli4 from Superb! Bought it and I love it. When down loaded the whole game you can collect 3 stars on all the levels if you want. If you like mahjong by this one. Rated 4 out of 5 by cceepp from Quirky and Different I enjoyed this game after I began to understand more about how to play it by playing it. It's different, which is good. I decided to write a positive review to encourage more game makers to venture out beyond standard mahjong like this game has. I love mahjong, so I play all kinds. How different Mahjong Huntress is is a refreshing change. I liked how this game had the pendant and the match fights. I'd change the game so it would have a relaxed mode, though. I like to play without having to beat the clock. There could have been more of the story packed into the dialogue boxes because it got tedious to have a box come out over and over just to say a few words. The artwork is beautiful. Rated 4 out of 5 by intlwoman from Different, and not that bad I may be in the minority, but I love Mahjong, so I can put up with a lot more than maybe some other folks. The QC as far as spelling goes in the story line is awful, but the challenging Mahjong comes in the Mystery Challenge part. I played one Challenge about 14 times, because I refused to use a power-up or pendant. The level 8 is where people get stuck, and you have to have enough power-ups to get through it. You have to play all 7 levels and then go back and play them again to get the stars that get you the power-ups. It's kind of AC/DC. Not a well-thought out game in terms of logical progression, but there's enough here to keep you occupied on an afternoon.